A great way to show that special someone how much you appreciate them!You can personalise the front of this card with a name at the top up to 12 characters.The words 'I love you to the moon & back to infinity & beyond' are fixed. You can then add a message to the inside of the card over 5 lines of 25 characters per line.All personalisation is case sensitive and will appear as entered.All Cards come in a brown outer envelope with a Plain White envelope inside. 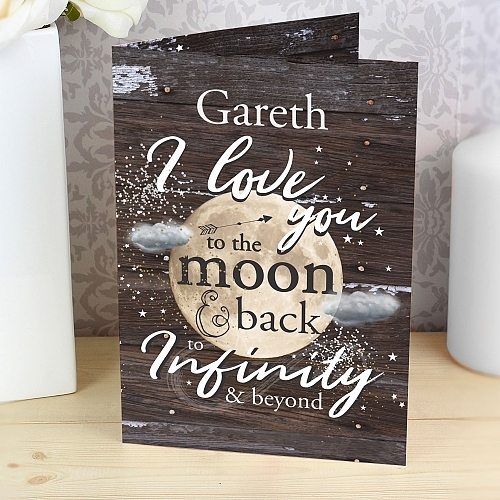 All cards measure 185mm x 132mm.Our great value cards include free standard delivery.Card orders received before 1pm will be dispatched the same working day.Ideal for Valentines, Anniversaries, Birthdays.